Picture your dog taking pictures. Then picture yourself taking pictures of your dog taking pictures. You know you want to. Thanks to the canine-friendly engineers at Nikon Asia, your pup could one day become a flashy #dogarazzi, without even knowing it. No joke. The Japanese camera maker is teasing a strap-on ”smart” camera case that lets man’s best friend snap pics. The lightweight 3-D printed rig, worn with an included harness, takes photos whenever Sir Barks a Lot’s heart flutters with excitement. So that would be, like, every few -- squirrel! -- seconds. Using sensors, the tech, fittingly called Heartography, continuously measures its furry wearer’s heart rate. When Fido’s ticker jumps for joy, then -- *snap* -- a pic is automagically taken. So many feels captured on the run. Just imagine the reams of riveting action shots of fire hydrants, food bowls, tennis balls and, yup, other pups’ hind quarters to come. Well, what do you expect? We’re talking dogs here, people. Dying to get your paws on your own Heartography? Sorry, fur baby mamas and papas. 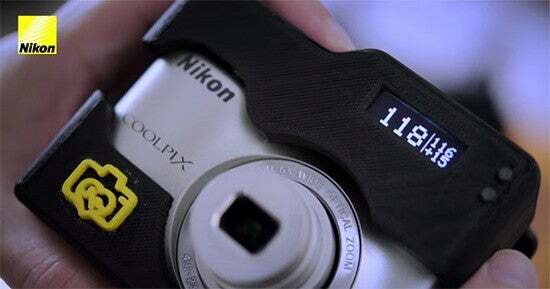 The poochy case -- which of course is made to hold (and promote) a Nikon COOLpix L31 -- isn’t on the market yet. No official word yet on when it will be either. Hmmm. 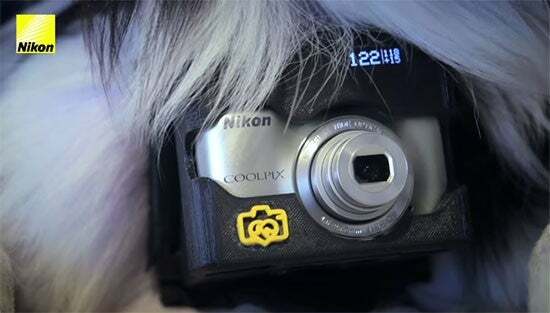 Maybe GoPro’s dog camera harness Fetch got Nikon’s tail wagging for a bite of the budding dogographer market. We blame Lady Gaga’s snap-happy French bulldog Asia. Instagram, prepare thyself. Photography has gone to the dogs.